Guilford’s Miabella Diaz takes a shot during Monday game against Foran. 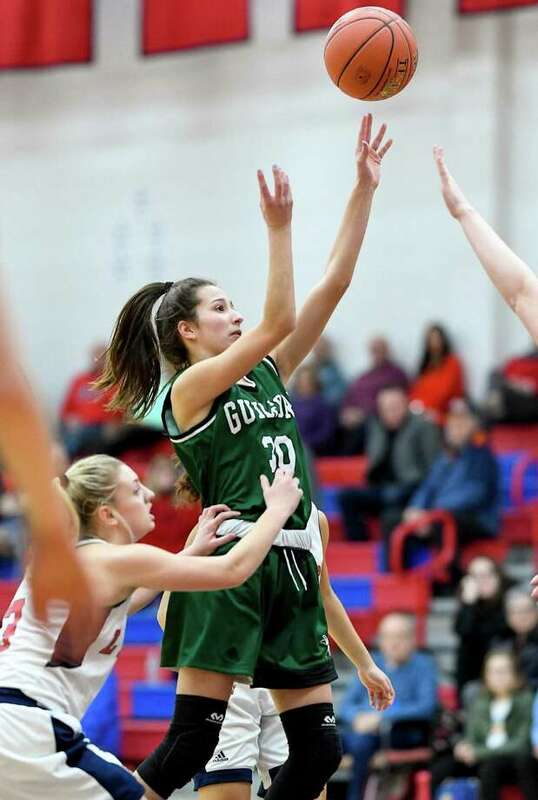 But it was until senior Janie Danaher blocked a potential game-tying 3-pointer that Guilford coach Bob Welsh could exhale. Diaz, Danaher, Lauren Cunneen and Faith O’Donnell finished in double figures for Guilford (10-12). Foran, the No. 12 seed, broke on top 10-0 and held a high-water mark between five and eight points for much of the contest. Mia Tunucci scored 18 points and Jasmine Lord 12 for the Lions (13-10). Tipoff Thursday in East Haven is 7 p.m.